Standing Tall, a photo by carolinearmijo on Flickr. 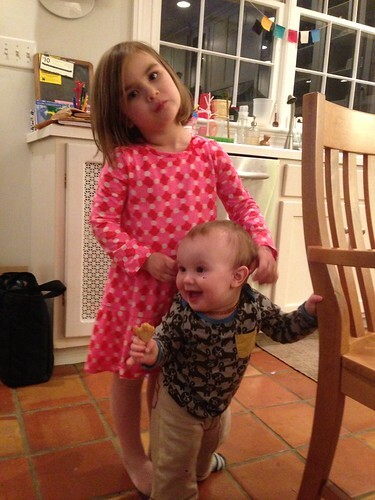 Oliver is half as tall as Lucy now. Today he is 43 weeks, which is just nine weeks away from the big day. That reminds me of the quarter system in school. And that means our year is winding down. Yesterday I suspected something being off again. Yep. Another Wonder Week – Day one of his seventh leap. Plus the two of us have head colds and I suspect a couple of more of his teeth are trying to break through. At this point he has his two uppers and two lowers. Plus the little point on the back canine is still there broken through. Is this a subtle reminder that I should save for braves? Because I hadn’t even thought about it until now. We went over to Cora’s today to create fossils and walked home in a blizzard. I had no idea it was supposed to snow until I tried to make plans for today. We are well stocked on bread. So French Toast in the morning!